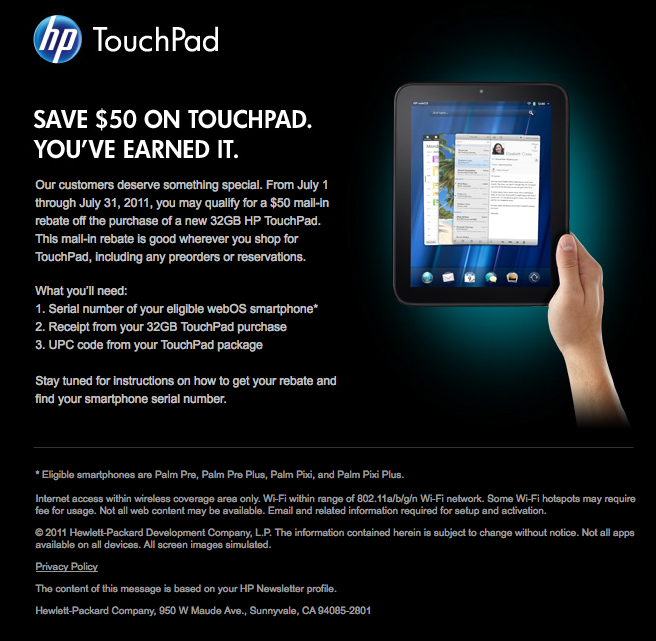 Do you receive your HP TouchPad “make it right” email? There has been plenty of confusion related to the announcement yesterday that early webOS adopters could receive a $50 rebate with a 32GB TouchPad purchase. Some folks have received the email below, but a number of users have not, including myself. One would assume you are still eligible if you purchased a Palm Pre, Palm Pre Plus, Palm Pixi or Palm Pixi Plus, regardless of your current phone. Let’s say you’ve moved to a Veer, then your older Palm Pre would still make you eligible based upon this email. Based on the eligibility requirements above, please take this quick poll and let us know if you’ve received your email from HP. We should learn more once the final submission forms become available. As noted in the email, HP advises us to “stay tuned” and they will will provide instructions on how to get your rebate.